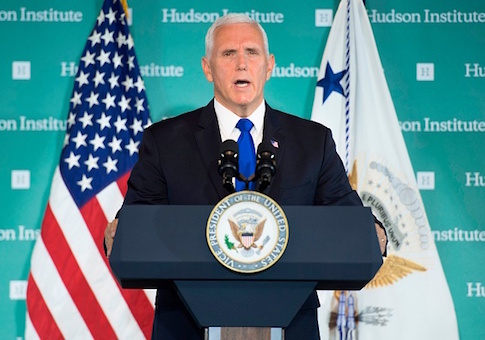 Vice President Mike Pence expressed solidarity with the Venezuelan people and support for opposition leader Juan Guaido against authoritarian Nicolas Maduro in a new video released Tuesday. Guaido heads the democratically-elected National Assembly and will lead massive protests on Wednesday in hopes of unseating Maduro, the socialist strongman who has presided over economic ruin and brazen human rights violations in Venezuela. In a video posted to social media, Pence introduced himself by saying "Hola," the Spanish word for hello. "On behalf of President Donald Trump and all the American people, let me express the unwavering support of the United States as you, the people of Venezuela, raise your voices in a call for freedom," he said. Maduro, Pence said, was a dictator with no legitimate claim to power, having never won a free or fair election, who has maintained his grip by cracking down on the opposition. Maduro was inaugurated for a second term earlier this month, but his "election" has been described as a sham with no legitimacy by human rights watchmen. Now, international pressure is growing against Maduro in the wake of his disputed election and the rise of Guaido. Pence spoke to him by phone last week, according to Reuters, to express U.S. support for the National Assembly as the only legitimate governing body in the troubled country. "The United States joins with all freedom-loving nations in recognizing the National Assembly as the last vestige of democracy in your country, for it is the only body elected by you, the people," Pence said. "As such, the United States supports the courageous decision by Juan Guaido, the president of your National Assembly, to assert that body's constitutional powers, declare Maduro a usurper, and call for the establishment of a transitional government." "As you make your voices heard tomorrow, on behalf of the American people, we say to all the good people of Venezuela, ‘Estamos con ustedes.' We are with you," Pence added. "We stand with you, and we will stay with you until democracy is restored and you reclaim your birthright of libertad." He finished by saying, "Vayan con Dios," meaning, "Go with God." Guaido has called for the military to cease support for Maduro and for new elections upon the formation of a transitional government, Bloomberg reported. The Trump administration has made opposition of Maduro and his inner circle a centerpiece of its foreign policy, cracking down on his regime with sanctions and slamming him as illegitimate. This entry was posted in National Security and tagged Donald Trump, Mike Pence, Nicolas Maduro, Venezuela. Bookmark the permalink.